An input field allows to enter various types of data. For input validation, please consider the validation guidelines. In Dynatrace all displayed input fields are mandatory. 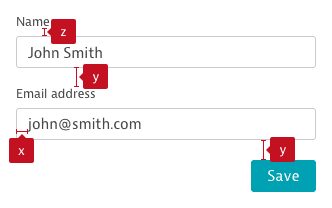 If an input field is optional this is indicated by a placeholder text optional. When input fields are used in a form together with labels and buttons use the following measures. Input fields can also be used within a sentence. It’s possible to have several of these sentences underneath each other. Input fields can be extended by hints that should help the user preventing errors. Use the form field component to combine input fields and hints. Permanent hints are placed right or left below the input field and always visible to the user. Live hints are used to help the user while typing. They appear as soon as the focus/cursor is on the input field. dtInput is a directive that applies Dynatrace styling to native <input> and <textarea> elements and allows them to work with <dt-form-field>. To apply the Dynatrace input, add the dtInput attribute to the <input> and <textarea> elements. All valid <input> and <textarea> attributes can be used on dtInput including ngModel and formControl. The only exception ist type where not all values are possible. button, image, reset, submit Use the button component instead. checkbox Use the checkbox component instead. file Is not (yet) supported. Maybe there will be an upload component in the future. hidden Hidden input fields should not be a thing in a client side app. They also do not need styling. range Is not (yet) supported. Maybe there will be a slider/range component in the future. @Input() id string - Id of the element. @Input() disabled boolean false Whether the element is disabled. @Input() required boolean false Whether the input is required. Used for validation. @Input() placeholder string - Input placeholder text. @Input() type string text Input type of the element. See valid types above. @Input() value string - Input value of the input. @Input() readonly boolean false Whether the input is readonly. @Input() errorStateMatcher ErrorStateMatcher DefaultErrorStateMatcher A class used to control when error messages are shown. empty() boolean - Whether the input is empty. The dtInput directive works with native <input> and <textarea> to provide an accessible experience. If there&apos;s no <dt-form-field> used and the input does not contain a <dt-label>, aria-label or aria-labelledby attribute, it should be added. Any dt-error and dt-hint are automatically added to the input&apos;s aria-describedby list, and aria-invalid is automatically updated based on the input&apos;s validity state.